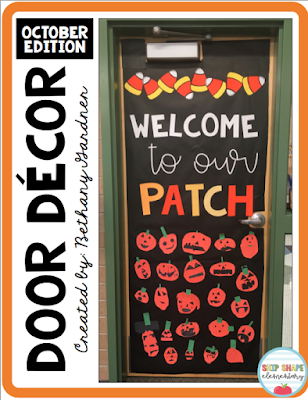 Ship Shape Elementary: October Door Decor! I had such a blast creating a fun decorative door last month that I just had to do it again for October! After a bit of brainstorming, cutting, rearranging, and gluing, here is the finished product! My students each created their own darling little pumpkin for the door. They LOVED contributing and I love how each one is totally unique and reflects their big personalities! I've compiled everything that you need to make your own October door. I get so many compliments on this and I know that you will too! The packet includes the font and clipart templates, as well as detailed directions to help you make your own masterpiece. It really isn't hard at all, and you will love the finished product! You can get this door decor kit by clicking the link below. Keep an eye out for more kits coming soon! I have something REALLY cute in mind for November so make sure you follow along and subscribe so you don't miss out!